When I worked as a graphic designer at The Mississauga News, I took over the design of the Mississauga Library System’s newsletter. 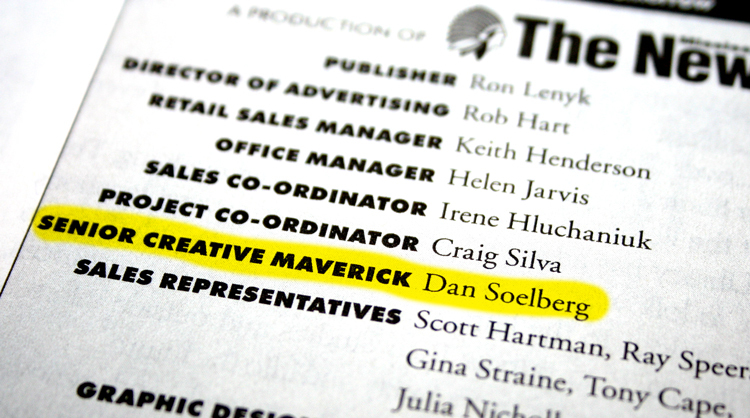 Without asking permission, I gave myself the title “Senior Creative Maverick”, which was printed in the publication’s masthead. It’s a fitting title, and nobody ever told me to change it. When you’re a child you must always ask permission. You constantly rely on adults for guidance before you do anything. Adventurous kids learn early that they don’t really need to ask. They figured out that they could just go ahead and do what they want. Besides, adults don’t even know what’s going on most of the time so there are no consequences. Once in a while they get caught. That’s when they apologize. I was one of these kids. I wasn’t trying to get away with doing bad things, I just wanted to take charge and be independent. I was a born maverick. My mom tells me that when I was barely older than a toddler, I’d routinely wake up really early and walk out of the house to explore the world alone while the rest of the family slept. This is typical of my behaviour. I got in trouble with authority figures occasionally and made my parents worry. I sincerely didn’t mean to, and I felt badly for causing grief. I learned to ask forgiveness and tried to cause less worry. I have since learned that this is a widely understood principle amongst entrepreneurs. Innovation is the goal of many entrepreneurs, and you can’t innovate without shaking up the status quo. So, rather than asking authorities for permission to launch an initiative and risk refusal, they just do it. If some feathers are ruffled, they beg forgiveness. There is risk in living this way. Speaking as a seasoned maverick, I think there is greater risk in not living this way. Inaction is guaranteed failure. Sometimes you just have to get things done and let the chips fall where they may. If you are offended by this philosophy, forgive me.